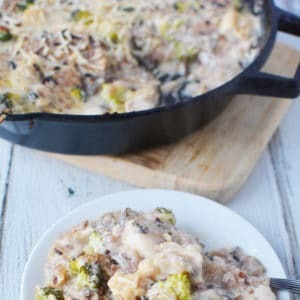 This creamy chicken and broccoli casserole recipe makes for a really great meal. I’m on a casserole kick as of late. So, expect a few more coming up. I just find that I usually turn towards this kind of meal when I am having a crazy day. There’s nothing easier than throwing a bunch of ingredients together into one skillet/pan and then giving myself time while it cooks in the oven. Nothing to watch on the stove! I can actually tend to the rest of the house or be with my kids. Yes, chicken and rice casseroles are my favorite and I hope they become yours as well. 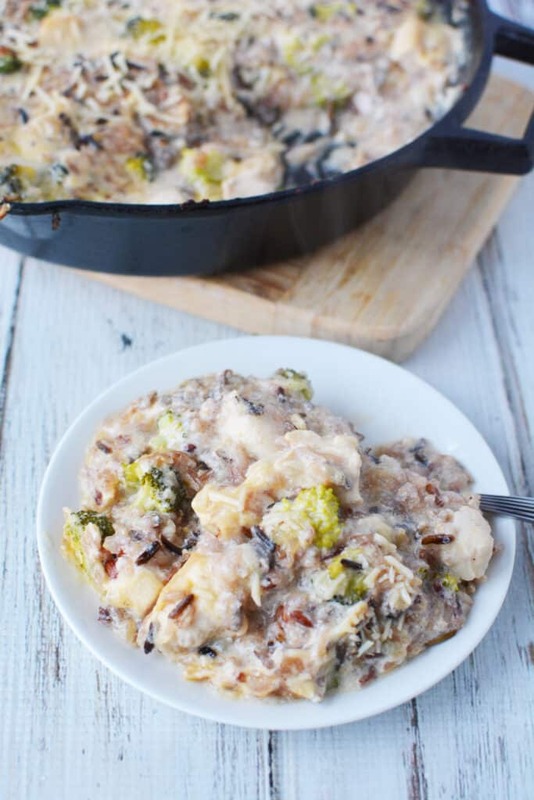 Let’s talk a bit about how you make them – especially this creamy chicken casserole. I just want to say off the bat that if you don’t have an ovenproof skillet like the one pictured in this blog post, you can pour everything into a greased casserole dish and use that to bake your meal instead. Don’t get caught up in what I use. I have a rice cooker which I LIVE AND DIE FOR, but you can always make rice the traditional way or go for something a bit more instant. That is up to you. But if you haven’t purchased a rice cooker yet, it has changed my life and for the better. When I am in a pinch, I throw a bag of frozen rice from Trader Joe’s in the microwave and admittedly it’s just as good. 🙂 Very rarely do I make rice on the stovetop, I don’t have the patience for it anymore ever since I ‘ve seen the rice cooker light. And for $25, you can too. 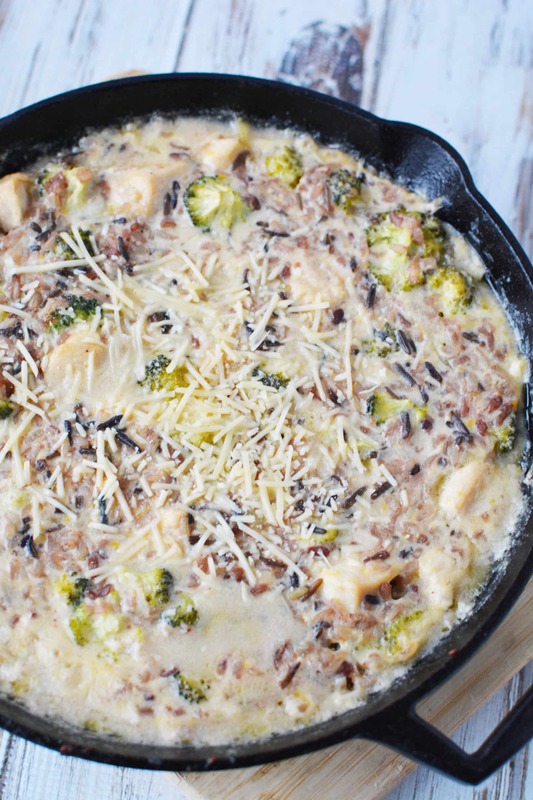 Alright, let’s get right to this Creamy Chicken and Broccoli Casserole Recipe. For this creamy chicken casserole, you need a large skillet. Heat oil, garlic, onion, and chicken all together. 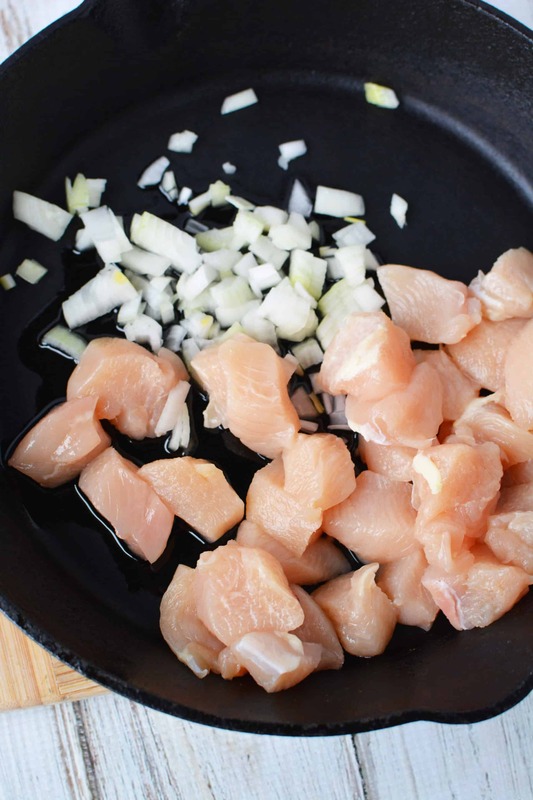 Cook until chicken is browned on medium heat. Since it’s a chicken broccoli casserole, we need to add the broccoli, right? Add the broccoli and cook it for an additional 2 minutes or until bright green. Stir in the rice and add your seasonings. You are almost done with your Creamy Chicken And Broccoli Casserole. 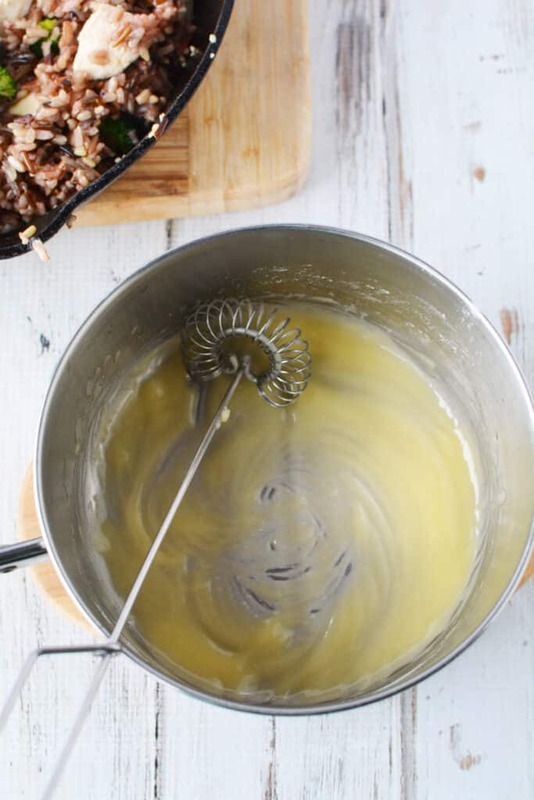 Grab a small saucepan.In that small saucepan, heat butter and flour whisking constantly until combined. Add your milk and heat on medium, stirring constantly until bubbly. Remove from heat and stir in sour cream and cheddar cheese until completely melted. Pour over chicken and broccoli mixture. Mix well. This is going to help create that creamy chicken casserole we are all hoping to achieve. Your chicken broccoli cheese casserole will need to bake in a 350-degree oven for 25-30 minutes or until bubbly and heated through. When it is done, top with Parmesan cheese right before serving. In a large skillet, heat oil, garlic, onion and chicken. Cook until chicken is browned on medium heat. 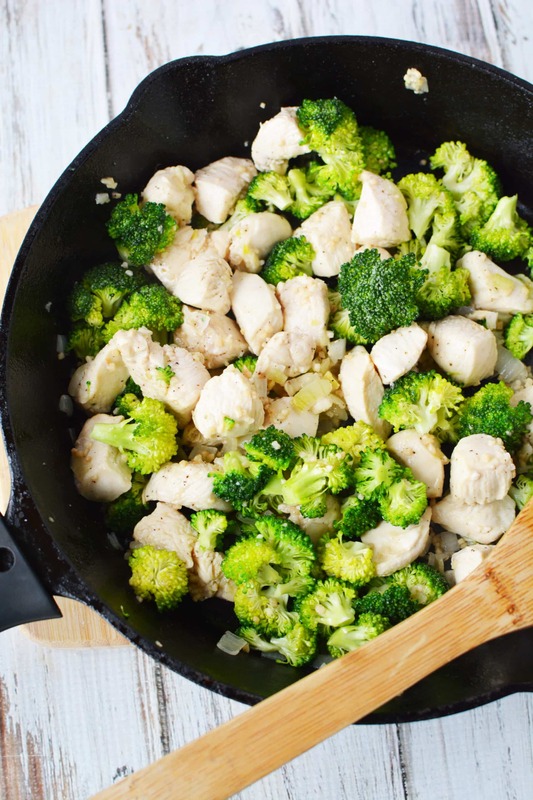 Add broccoli and cook for an additional 2 minutes or until bright green. Stir in rice and add seasonings. In a small sauce pan, heat butter and flour whisking constantly until combined. Add milk and heat on medium, stirring constantly until bubbly. 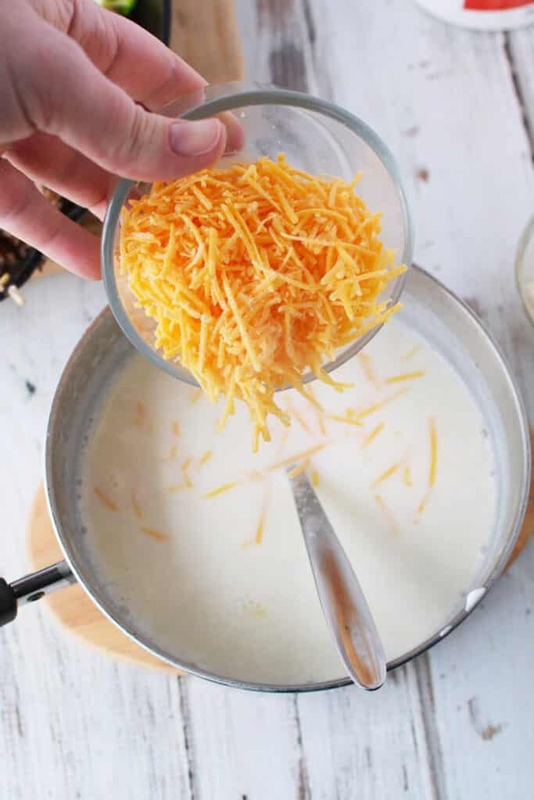 Remove from heat and stir in sour cream and cheddar cheese until completely melted. Pour over chicken and broccoli mixture. Mix well. Bake in a 350 degree oven for 25-30 minutes or until bubbly and heated through. Top with Parmesan cheese before serving. 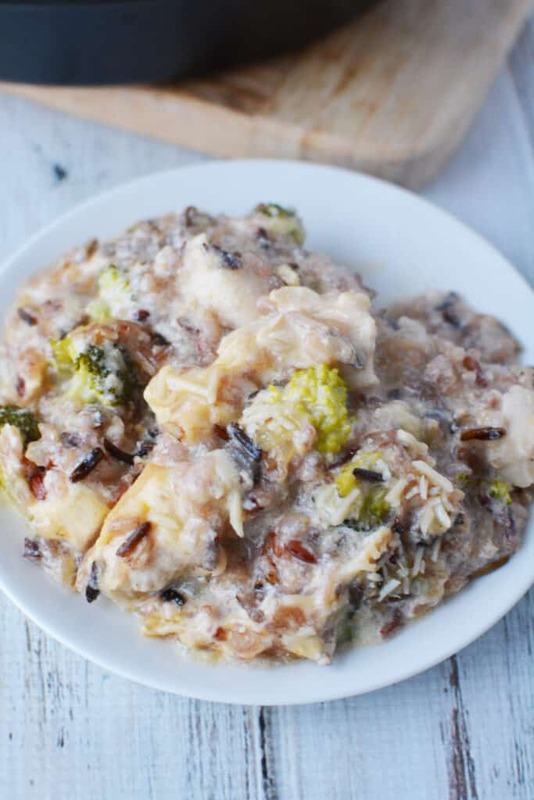 Do You Have To Cook The Rice Before Baking This Easy Chicken Casserole Recipe? Do I Need Any Side Dishes? I don’t think so. You have a vegetable, a starch, and a protein in this dish. If you’d like to make a nice side salad to accompany the meal, that would be great. However, I don’t think it needs it. I usually put out a bowl of cucumbers and tomatoes only because I like to make sure my children always eat something fresh and juicy during every meal. That could be an easy option. But one of the reasons why I love chicken casserole dishes is because they have everything you need.